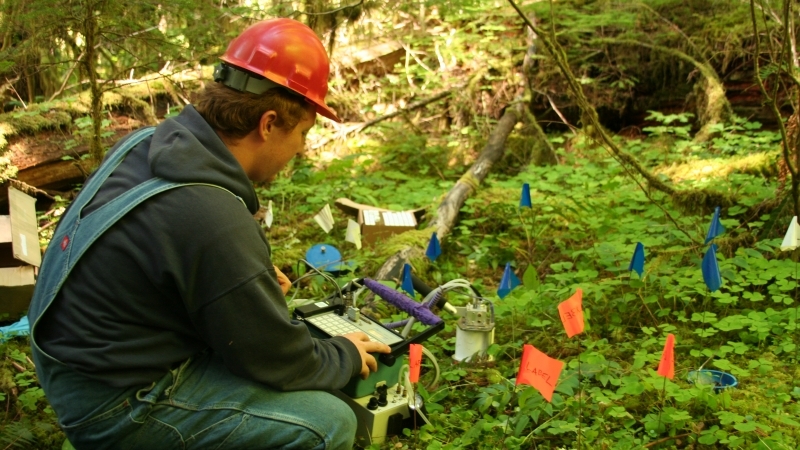 Graduate students are a critical part of the research program at the Andrews Forest. Graduate students have the opportunity to participate in various events and activities throughout the year, and also interact with faculty and other graduate students from a wide variety of disciplines. We welcome any graduate student interested in joining the Andrews Forest LTER program. The Andrews LTER program provides opportunities for training and development, including workshops on data management, emerging technologies, experimental design, grant writing, science communication, and incorporating broader impacts into your research. Our email lists are used to share job and funding opportunities for the Andrews Forest, the LTER Network, the OSU research community, and beyond. Long-Term Ecological Research Network sites exist across the country and around the world. Participating in the program opens up numerous opportunities for LTER graduate students to network, travel, use long-term datasets, and learn new technologies. By joining the Andrews Forest LTER community, graduate students have a chance to get involved in long-term, integrated research and a community of interdisciplinary scientists, scholars, and students. Sign up for the LTER graduate student email list by contacting the Andrews Forest LTER Coordinator. Through this email list you will receive communications about monthly meetings, graduate student activities, job opportunities, funding opportunities, and other news from the Andrews Forest community and broader LTER network. Attend LTER Meetings. LTER monthly meetings are held the first Friday of each month throughout the academic year (October - June). Typically the first hour of each meeting is dedicated to research presentations. These "Science Hour" talks give students a chance to learn about the diverse range of work being done at the Andrews Forest. The second half of the meeting is spent sharing announcements, site use proposals, significant publications, new funding opportunities, safety issues, Forest Service updates, and graduate student activities. This is a great way to keep up with what's going on at the Andrews Forest, and also to meet and network with other members of the Andrews Forest community. Do research at the Andrews Forest. If you are interested in starting a field project at the Andrews Forest, please see the Guidelines for Researchers page and contact the Forest Director to learn more about how to get started. Use data from the Andrews. It is easy to tap into extensive, long-term datasets to enrich and broaden the scope of your research project. Our databases include decades of climate and hydrological data, GIS maps, species lists, and vegetation data, all available on the web. Data use should be in compliance with our Data Access Policy. Please contact one of our Information Managers for more information. Participate in LTER events. Throughout the year there are a number of opportunities to interact with the LTER community and to learn more about long-term ecological research through events and meetings. The Andrews Forest Symposium is a great way to hear about various projects occurring at the Andrews Forest, and graduate students can also present posters to share their own research from the forest. HJA Day is typically held at the Andrews Forest during the third week of June. At this event, which is usually attended by OSU researchers, educators, and students, as well as forest managers and local community members, presentations and field trips highlight some of the work done at the forest. The LTER All-Scientists Meeting, organized by the LTER Communications Office, is held every three years in September, bringing together scientists from across the LTER network. The Andrews Forest LTER program generally offers support for several graduate students to attend the meeting. In addition to community-wide events, the Graduate Student Representatives also coordinate periodic activities specifically for LTER graduate students. For example, every month a different Andrews Forest researcher is invited to join the graduate students for coffee, snacks, and good conversation. By adding your name to the ltergrad email list, you will receive notifications whenever these and other activities are being offered. Email the Andrews Forest LTER Coordinator to have your name added to the graduate student email list. Share your research through social media. Graduate students doing research at the Andrews are encouraged to write posts for the LTER graduate student blog, provide content for the Andrews Forest YouTube channel, for the Andrews Forest Facebook page, and the Andrews Forest Twitter feed. If you are interested in contributing, contact the Andrews Forest LTER Coordinator.